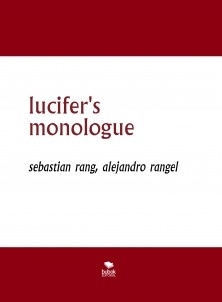 lucifer's monologue, focuses on a story long before the genesis and the creation of humanity, according to Christian ideology. but this story is nothing like you have told us so far, as this is the version of lucifer, the villain and the great tyrant of the Bible, which, comes to tell his version of events, from the beginning, even as he was banished to inferno. Here lucifer tells us how it all started, why a lot of our questions, or rather because a lot of the holes found in the biblical version of the dispute between him and the supreme power he had at the time, and we It gives another perspective on the big picture. Who is the villain and who is the hero Or is there really a villain or a hero , are these questions, we will take all this intrigue plot, but ultimately it is the reader's opinion which will decide the answer. and eventhough the story is narrated by lucifer, iconic characters, like, astaroth, satan, Mannon, leviathan, among others ... form a fundamental part in the development and the outcome of it. the hehcos are located mainly in the infamous city of Zion, but yet unknown land inferno and mother also take a lot of influence in history. many stories are seeking boast a good protagonist does not matter if it's good or bad, but this is clearly not that kind of story, empathy you can possibly have for any of the characters is just personal opinion, because none of them looking to impress no one, not even Lucifer himself, this being his own story, just come to have a frivolous version of a trascedendental done. This is a completely fictional story, where we find a lot of references and names that may seem familiar to us are just more characters and situations that give life and substance to it.